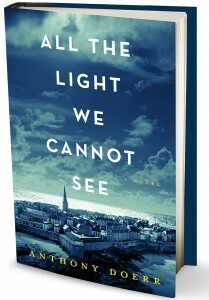 I’m leading a discussion of “All the Light We Cannot See” this afternoon for the book club Kerry and I belong to. The novel, by Anthony Doerr, was a finalist for the National Book Award in the fiction category last year and was on the top of a bunch of “Best of” lists. It tells the story of two young people whose lives are connected in ways they cannot fully know during the Second World War: Werner Pfennig, a brilliant young orphan from Germany and Marie-Laure, a blind girl from Paris forced to navigate a world she has never known when she and her father are forced to flee the city as the Germans invade France. You will become like a waterfall, a volley of bullets — you will all surge in the same direction at the same pace toward the same cause. You will forgo comforts; you will live by duty alone. You will eat country and breathe nation. I was struck by the sacramentality of that passage. “You will become like a waterfall … You will eat country and breathe nation.” It was as if Werner was being baptized into a national ideology of merciless strength and unquestioning obedience. After he’s been at the camp for a while he and his best friend, Frederick, are forced to take part in the torture of a prisoner of war by water-boarding. As he stands in line with the bucket of water he is expected to toss at their victim, Werner is aware of his deep desire to flee the situation but “when his turn arrives, [he] throws the water like all the others.” When it comes time for his friend Frederick to do the same, he pours the water out on the ground and refuses to take his part in the game of violence. As a consequence he is repeatedly targeted by the other boys who begin to bully him with increasing severity. The readiness with which the German people were able to accept horrific violence against their own countrymen, and to participate in it, has been explored over and over again in literature and drama. Nazi Germany has become an archetype of socialized violence so large that it sometimes seems to obscure the ongoing inurement to violence with which we all struggle. At one point in the novel a gem appraiser marvels at the rare treasures pouring into the Third Reich, although “where the police confiscated these treasures and from whom, he does not ask.” We, of course, know that these treasures are being stolen from the Jewish families being evicted from their homes and sent to concentration camps. The gemologist is too easy to hate, but what about me? What treasures flow too easily into my and Kerry’s home at the expense of people whose names we will never know? Who pays the price for our food to be so inexpensive, our gasoline to be so abundant, and our clothing to be so cheap? Have we been conditioned to look the other way so often that we no longer even know when we’re doing it? The Gospel of Mark doesn’t bother with stories about Jesus’ birth or childhood. Instead it launches immediately into a scene of people from the city of Jerusalem and all across the Judean countryside leaving the world they’ve known and coming to John to repent and be baptized. For the gospel of Mark, the story of Jesus begins with his baptism into a movement that was calling people away from their participation in a culture of state-sponsored violence, away from the occupation by empire, in remembrance of their identity as people saved by the God who led them out of slavery and into the wilderness. As soon as Jesus is baptized the Spirit drives him further into the wilderness where he is tempted by Satan. Mark’s gospel doesn’t describe the scene with the detail found in Matthew and Luke, but it does name Satan as the agent of temptation. I’m going to ask you to open the hymnal in the back of your pew to page 232 where you’ll find a rite titled “Welcome to Baptism.” As you scan these pages they should look familiar to you, since it is a form of the rite we’ve been using this morning as we welcome our friend Ryan into a period of preparation for his baptism later this spring at Eastertide. For some, that question barely makes sense. For all the ambivalence we may have about the images of God on which we were raised, we’ve been given even less to work with when it comes to the devil. Red face paint and plastic pitchforks at Halloween. Scarlet cherubs sitting on Fred Flintstone’s shoulder tempting him toward what is wrong. Fire wielding demons on the CW. Are any of these what we mean when we speak of Satan? The renunciations that follow suggest as much, taking the choice between God and the devil out of the cosmological and into more intimate and recognizable language. “Do you renounce the powers of this world that rebel against God?” and “Do you renounce the ways of sin that draw you from God?” Our baptisms are not a public commitment to stay the course. We don’t promise not to veer off the path. We aren’t endorsing the status quo. Rather, in baptism we join the crowds that left Jerusalem and the surrounding countryside, who could not accommodate themselves to the violence of empire going at that time by the name “Rome,” who lamented of their participation in its ongoing dehumanization of life, theirs and their neighbor’s, who wanted to return to the God of the wilderness, the God of liberation from slavery. They were ready to revolt from the world as it is, not endorse it. And this is how Jesus’ own ministry began as well. Ryan, we’re so happy that you’ve chosen to be baptized and we look forward to preparing with you for that day when you will make these renunciations in public, for all the world to see, and by so doing you will join the ranks of the saints and martyrs over every time and place who have seen with open eyes the cruelty of the world and have claimed their citizenship not on this earth but in a divine commonwealth of radical equality where all are welcome and there is always enough. On the day of your baptism you will not speak these renunciations alone, you will be surrounded and supported by the members of this congregation who will speak for the whole church as we affirm our baptisms with you. Your witness will strengthen ours, and vice versa, because baptism is not something we undertake alone, but together, strengthening and encouraging each other as our eyes are opened to all the ways the world is killing us and embracing the alternative life God is offering, a life we see clearly in Jesus who pours out his life in a public testimony to the God of peace and justice and love. Together we will become like a waterfall, each life a drop in the torrent of time, carving a new path forward through the wilderness where we will feast on the reign of God and breathe the new life made possible by the Holy Spirit.